The event would bring the libertarian TV personality to Pitt to speak about the value of business, industry and entrepreneurship. EBA has already received $10,000 from the Young America’s Foundation, covering roughly half the cost of the total event. The board approved funding for the remaining cost of the event, granting the full $11,139.93 allocation request. “For me, with the attendance only being expected to be 200 and given that you are a newer organization, I just don’t feel comfortable giving the full amount, so that’s just where I stand,” Kent-Smith said. 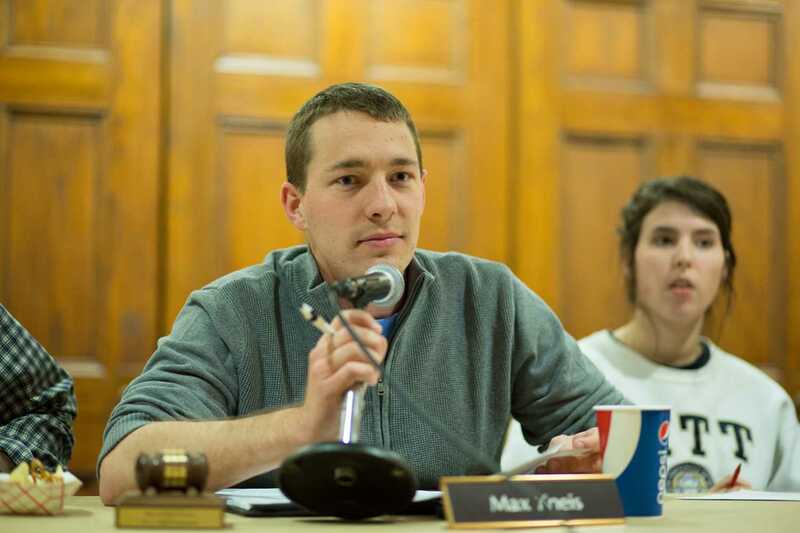 Students for Liberty President Ben Sheppard, a senior majoring in history and political science, and EBA President Troy Emswiler, a senior chemical engineering major, spoke on behalf of their respective organizations. While there wasn’t full agreement across the board, the final decision was to fund the group’s event. Before the allocations debate, though, Fall discussed her plan for health and wellness resources and academic resources during her board report. She said they will be available on Blackboard for Pitt students in a few weeks. The resources will be available on the Courseweb homepage via a link that will direct students to another Pitt-affiliated website. The health and wellness section will discuss on- and off-campus resources, while the academic resources, as of right now, are only on campus. Fall is working with Assistant Director for Marketing and Communications Janine Fisher from Student Affairs, and Associate Dean and Director of Residence Life Steve Anderson on the health and wellness resources. “It’s a great opportunity to better advertise these resources to students. I know a lot of people may not be aware of them and it might be difficult to navigate, like, finding a specific resource under health and wellness so just having it all in one place … I think it will be very helpful to students,” Fall said. SGB was also asked to send a representative to the University’s socially responsible investing ad hoc committee. After several students from Fossil Free Pitt Coalition encouraged the Board of Trustees to divest from fossil fuels, the ad hoc committee was created last fall to discuss whether prioritizing environmental and social issues is feasible when directing the University’s investment plan. “And while this committee does not directly address that question of [whether universities should holistically look at investments] it’s looking at the broader scope of the University’s investments and how our investments relate to the University’s mission and how we can best connect those two,” Kneis said. Ben Sheppard is a columnist at The Pitt News. Pre-Medical Organization for Minority Students requested $3,599.40 for their Annual Medical Education Conference for registration, airfare, ground transportation and lodging. The board approved $1,999.40 and denied $1,600. Ski and Snowboard Club requested $1,654 for club merchandise. The board denied in full. Pitt Lawn Sports requested $253.75 for a purchase, rental and service. The board approved in full. Free the Planet requested $2,700 to sponsor one of their members to attend the PittServes Iceland Alternative Break trip. The board denied in full. Food Recovery Heros requested $285.48 for general travel. The board approved in full. Pittsburgh Women’s Volleyball Club requested $556.96 for a competition expense. The board approved in full. Pittsburgh Women’s Volleyball Club requested $2,812.70 for their Spring Commodore Classic. The board approved in full. Ballet Club requested $1,325 for their Spring Show for tutus and lightning and sound equipment. The board approved $1,313.35 and denied $11.65. Students for Liberty requested $11,139.93 for their “John Stossel Speaks” event for honorarium, airfare, lodging and security. The board approved in full. Model United Nations requested $2,092.44 for their Virginia International Crisis Simulation for registration, ground transportation and lodging. The board approved $1,878.92 and denied $213.52. Circle K International requested $1,102.33 for a conference request. The board approved $544.30 and denied $558.03. Ski and Snowboard Team requested $2,286.34 for a competition expense. The board approved in full. Pitt Racquetball Club requested $283.49 for a competition expense. The board approved in full. Pitt Women’s Club Soccer requested $905.12 for a competition expense. The board approved in full. Fashion Business Association requested $777.34 for a purchase, rental and service. The board approved in full. A previous version of this article reported that the allocations committee had its first divided vote. This is incorrect as the board voted and was divided. The Pitt News regrets this error.